With a reputation as the adventure sports capital of the world, Queenstown is New Zealand's premier tourist destination, offering visitors the chance to indulge in almost every adrenalin activity imaginable. 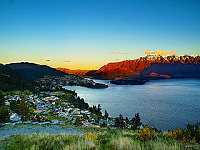 But Queenstown has more to offer visitors than action packed activities. Queenstown is a heavily commercialised, year round resort that is touristy, crowded and characterless, but with its magnificent scenery, set on the deep blue Lake Wakatipu and framed by the craggy Remarkables Range, it is appealing to adventurers and leisure seekers alike. The lake is the perfect setting for steamer cruises, there are many fine walking opportunities in the surrounding hills and valleys with breathtaking views. The surrounding vineyards offer wine tasting, and there is shopping at the town's many boutiques. The nearby historic gold mining town of Arrowtown is a fascinating day's outing. Scenic flights take visitors on unforgettable excursions, such as those around the majestic peaks of Mount Aspiring and Mount Cook, or to Milford Sound. Queenstown's popularity is also due to the fact that it is a year round resort, a renowned alpine playground for skiers and snowboarders in winter and activities such as jet boating, bungee jumping, luging, white water rafting and paragliding in the summer months.